David Davis’ Brexit department has the worst transparency record of any in central government, new data shows. The Department for Exiting the EU (DExEU) responded to just 17% of freedom of information (FOI) requests in full last year, according to a government release of annual statistics. This is less than half the proportion across government as a whole. Liam Fox’s department for international trade (DIT), which is also heavily involved in post-Brexit talks, were not far behind, responding in full to 21% of requests. Michael Gove’s environment department responded to 40% of requests in full, coming in just under the average of 46%. UK environmental law could be heavily impacted by Brexit, with up to four-fifths of regulation originating in the EU, from nuclear regulation to agriculture to fisheries. Trade deals could affect standards on food, chemicals and animal rights. One FOI expert told Unearthed that the lack of disclosure is another indication of how the government “has played Brexit in far too secretive a fashion”. 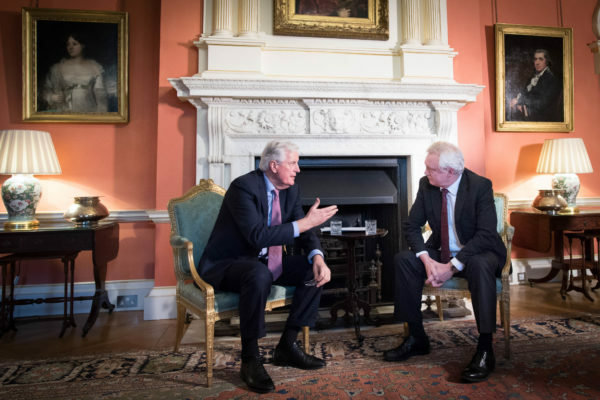 Despite Fox making a public pledge for transparency on trade deals, in December Unearthed discovered that DIT had signed a deal with US counterparts in which they committed to keeping post-Brexit talks secret. Two months later we revealed the existence of a secret database, housing cross-departmental work on Brexit, a large proportion of which concerned the environment. DExEU, which maintains the database, refused to release any information about it on the basis that it could risk the UK’s relationships with other countries. The data also shows that the Cabinet Office, which is itself responsible for the implementation of FOI law (and published the statistics), rejected 63% of requests in full, the highest proportion of any department in central government. DExEU and DIT rejected 61% and 45% of requests in full respectively. The small proportion of remaining requests were partially withheld or are still waiting a response. DExEU saw a fourfold increase in requests on the previous year, the largest rise of any department, but it has only existed since July 2016. Thirteen other ministerial departments received a greater volume of requests. The most common reason cited by DExEU for refusing requests was that it could affect the UK’s international relationships. Other commonly used exemptions included that publication could negatively affect the economy, the formulation of government policy and that information would be published at a later date. DIT’s most common reason for refusal was that publication could affect commercial interests. Ben Worthy, an FOI expert based at Birkbeck, University of London, said that there was some justification for these departments being more reticent to publish. He told Unearthed: “Both departments are new and involved with ongoing negotiations so they are dealing with sensitive policy areas. But the government in general has played Brexit in far too secretive a fashion. Longer term data suggests that transparency within central government has plateaued over the course of this parliament, with a steady decrease while the coalition was in power. In 2010, 57% of requests were responded to in full, compared to 46% last year. The data does not include requests where the department does not hold the information asked for, or where further clarification was required. Requests to local authorities, which make up a much greater proportion, are not monitored in this data.